thanks to Jastrow from Wikimedia Commons and Ookaboo! Why Harpocrates Speaks? After a bit of reading, it just seemed appropriate. 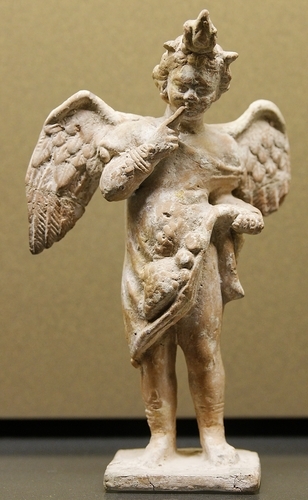 Harpocrates is the Greek god of silence and secrecy, derived from the Egyptian child-god Horus (Hor-pa-khered, or Horus the Child). For the Egyptians, Harpocrates was the protector of children and was associated with healing. Because the Egyptians often depicted Harpocrates as a child with a finger to his lips, the Greeks misinterpreted this as an indication of silence, thus adopting him as a god of silence and secrecy. 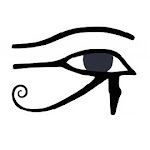 It was this double-role as the Egyptian god of healing and protecting children and the Greek god of silence and secrecy that appealed to me and seemed to fit with where I wanted this blog to go. I plan to focus my efforts on breaking the silence that the Age of Autism and similar crank blogs impose and focusing on issues that concern medicine and child safety and health. This will not only include articles about vaccines, but will also include some thoughts about other medical/ethical issues involving children. There will, of course, be topics that fit in with this goal that I don't write about because others have already covered them, I can't think of a decent way of addressing them or some other reason that precludes my blogging about them, but I hope readers will enjoy what I do discuss and add their thoughts in the comments. So, like the newborn sun rises from the darkness, Harpocrates Speaks is born (though, for the time being, the web address will remain unchanged). Born? Is it covered in all sorts of goo and crying? Seriously, though... Great idea. Best of luck. Newborn sun, not newborn son. Sheesh. And here I thought you had good reading comprehension. I never said I was smart... You all just kind of assumed it.